1) I guess the easiest place to start is, how exactly did you get into refereeing in the first place? 2) Did you always have aspirations of becoming a FIFA Referee or not? 3) What are the major contrasts in refereeing a game in Barbados to elsewhere? 4) How often do you train? 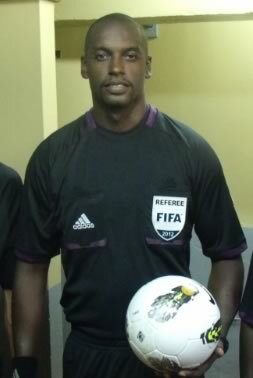 5) You officiated in last year’s Caribbean Cup qualification. What was that experience like? 6) You say you dream of being the best in the world at your job. How are you going about reaching that? One is my faith, I pray for God’s blessing everyday, on myself and my family, and that he bestows greatness upon me and my refereeing team (we pray together before every match). Two is the LOTG, we call it “The Book” it’s our guidance to how we should officiate on the field of play. Applying these laws with practical application will enable the game to be enjoyed as FIFA intended by all. 7) Your hairiest moment as a referee? 8) The most important trait as an officiator? 9) With the World Cup looming, are you aware yet of any potential involvement in Brazil? Thank you for reading! Feel free to leave any constructive feedback in the comments box below. Big up to Adrian for taking the time out of his busy schedule. You can get in touch with me on Twitter, Facebook and Instagram.